I understand these rules are intended to keep order and head off any possible incident or altercation. If nobody has a beach ball, then everyone's on even ground. If there are no radios, there's no argument about the music being played. If no one's wearing a color t-shirt that might upset someone else, there won't be a fight. But the way it's implemented is overkill. The guardians have let the small bit of power they've been given go to their heads. Throughout the years, the number one rule at the Red Hook Pool has been: Bring a Lock. If you don't have a lock, you can't lock up your stuff in a locker before you hit the pool. (No one can enter the pool area with anything other than a suit and a towel and maybe a book.) The Pool wasn't taking any chances of anything being stolen. I never saw anyone without a lock allowed inside the building. For years, a small padlock, about the size of a pack of matches, was acceptable. Even encouraged. Combination locks, meanwhile, were verboten. But here's the thing about the Red Hook Pool. You can memorize the rules down to the letter and it doesn't matter. Because they change them at whim, from year to year, from week to week, depending on who's guarding the door. This weekend, I went with my wife and son to the pool. We had proper suits, proper towels, no extraneous equipment and the right lock. Only it wasn't the right lock anymore. There had been some break-ins, we were told. The old padlocks were no longer acceptable. Now, to enter, one had to have a combination lock, or some other lock at least the size of pack of cigarettes. People were turned away in droves. I swear, at least half of the people in line were not allowed to get in. They were told to walk to a shop four blocks away where they could purchase such a lock for $2 or $3. I did so. The lock was $8. There was no warning of this rule change. I had, in fact, checked the list of rules before heading out. It said padlocks were allowed. I checked it again today. It's been changed to say, "Patrons must provide and use their own padlock. No responsibility is assumed for lost articles. A standard master or combination lock is recommended. Small luggage locks are not permitted." Another sudden change this year: men's bathing suits must have mesh linings. How they're going to check that one I do not now. I'll continue going to the Red Hook Pool. But I know a lot of people who are disgusted with the suffocating bureaucracy surrounding the institution, and the people who police it. This is the perfect example of when the government runs something you give up liberty. Just as in healthcare, in order to insure the estimated 20-30 million uninsured the Congress changed the rules for the other 300 million. Few years back I had the misfortune of taking my son to Wilson Woods Wave Pool in Mt. Vernon. Cops in the parking lot. Cops at the entrance. A professionally grumpy staff. lines. rules rules rules. There is an imposing black metal fence 10 feet high. Order! Then once inside whistles from the guards every 2 to 3 seconds for hours. I was laughing to myself at the spectacle of it all as soon as I got there. Then I heard this loud buzzer alarm. Bramp Bramp Bramp. It was to alert the swimmers that the waves were beginning. Then it all came together. RULES, COs, a wall, another wall, lines, guard towers, uniforms, and the exact same alarm sound as the one at Sing Sing. Welcome to Willsons Woods prison pool. I keep seeing this security overkill everywhere. I was recently in the Library at 31st and 3rd ave. Why are there security guards there? What goes down in that spot with the library system as broke as it is that it warrants having a security guard? Is the real purpose of these rules to keep kids who live in the housing projects in Red Hook out of the pool? Interesting post, considering what twice happened this week at McCarren. People all around the web are calling for stricter enforcement there, a la Red Hook. I gave you a pass sneaking in that absurd anti-healthcare dogma, Steve Kennedy. That's the only one you'll get. Stick to the pool. Ed: No. I don't think so. The kids in the nearby projects use the pool a lot. Dash: Just read the McCarren reports. Attacking a lifeguard is unacceptable. What a shame. Perhaps it is better to be annoyed, but safe, as is the case at Red Hook. I don't know. But it seems there must be some better middle ground. but i haven't been to the red hook pool so maybe i'm missing something? You can also look at the umpteen Gothamist threads on the subject (the comments are surprisingly restrained; maybe they are filtering out the racist comments). Anyway this is a real problem, civic amenities being overrun by gangs of hoods -and this dates back to when the gangs were Irish- is one reason why the city has been short of civic amenities. The rules at RedHook and McCarren are the same. They are NYC Park pool rules, applied at all locations. The staff had been rude and irritated at every pool I have been to. Must come from being an underpaid parks employee? 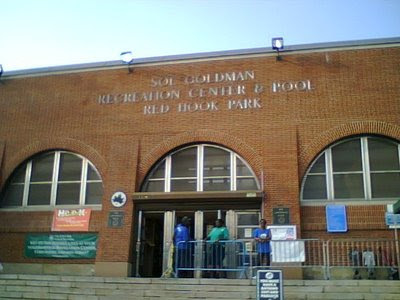 Getting from the front door into the pool (both McCarren and Red Hook) is like going through some kind of prison routine. I hate it. It does kind of take a lot of the fun out of swimming. Where do they get these employees? I think I heard they are actually in some kind of transition-to-work program. Maybe they're in some kind of system themselves, so they're used to being yelled at all the time, and herded like cattle, so they pass on the treatment. but maybe i'm jumping to conclusions. And to Steve Kennedy, plenty of cities have awesome facilities that are run by the government, without power-mad security guards running everything. It's not because it's government run, it's because of the culture these agencies have here in NYC. And yeah, the library can be pretty bad here too. Libraries should feel peaceful...the security guards make you feel like an inmate. Ugh.